Get $10 free chip from Miami Club Casino! Redeem the Miami Club Casino no deposit bonus code USA10BONUSCODE and get a $10 free chip with no deposit necessary! Make a deposit and receive a 200% match bonus! After you cash in on the $10 no deposit bonus, redeem coupon code USA200BONUSCODE for a 200% bonus up to $200. If you’d like to experience Miami Club Casino, then you’re in luck since the casino is offering new members $10 free to use at the casino however they like. This is a no deposit bonus, so while you do have to register a valid account, you don’t have to risk any real money at all. Once you’ve created an account and claimed the bonus, Miami Club will deposit $10 into your account. You can bet the entire $10 on a single hand of video poker or play slots at 50 cents a spin 20 times. Whether you’re claiming a no deposit bonus, a deposit bonus or something else, all coupon codes are used in the same manner. Log in to your account and click the Deposit button. This will open the cashier, which is where codes are entered even if you’re not making a deposit. If you’re not making a deposit, then click the Instant Coupon option. Copy your promo code and paste it into the provided box. Then, click the Redeem button. Your coupon code will be processed, and in the case of a no deposit bonus, your bonus will be applied to your account within seconds. 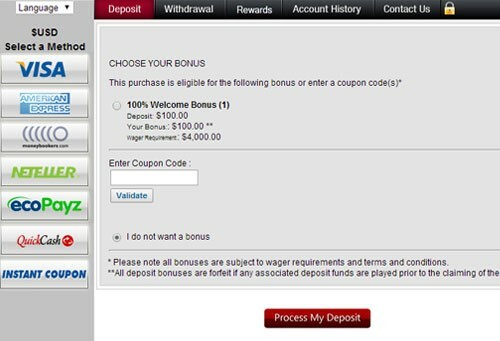 In the case of a deposit bonus, click the Deposit option and then choose your payment method. At this point, you’ll be given an opportunity to select various available bonuses as well a box where you can enter a particular coupon code. At Miami Club Casino, you cannot have more than one active bonus at a time. So, if you have a bonus active, you’ll need to meet the wagering requirements before claiming another. Note also that while Miami Club Casino generally doesn’t restrict which games are eligible for particular promotions, it does alter the amount a stake contributes to the requirement based on the game played. The exception here is for non-deposit bonuses, in which case, baccarat, craps and roulette are off-limits. Cashing out from a non-deposit bonus is limited to $150 one time unless you have made a real money deposit. In that case, you are allowed to cash out up to $150 twice but no more beyond that. All bonuses must be played through at least once. In the case of a deposit bonus, you must play through the deposit used to claim the bonus at least once as well. After playing through that money once, if your account balance is less than $1, then your obligation to Miami Club Casino is complete. Otherwise, you will need to meet a certain wagering requirement before claiming another bonus, cashing out and so forth. The wagering requirement for a no deposit bonus unless explicitly stated otherwise is 40x. In the case of the $10 free, you’d need to wager $400 before you can make a withdrawal. The wagering requirement for deposit bonuses unless explicitly indicated otherwise is 20x. If you were to deposit $25 and claim a $50 welcome bonus, you’d need to play through 20 x ($25 + $50) = $1,500. Note that not all wagers contribute to the rollover requirement fully. Slot machines, slot games, poker slots, keno and so forth do. Table games, however, only count 35 percent toward the requirement, and blackjack and video poker wagers only count 10 percent toward the requirement. In addition to the $10 no deposit bonus, you can also redeem these other Miami Club Casino bonus codes! 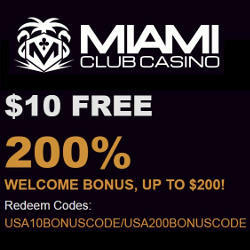 If you enjoyed your free experience and would like to continue playing, Miami Club Casino is offering coupon code USA200BONUSCODE, which matches your first deposit by 200 percent up to $200. The minimum deposit is $25. You’ll receive the bonus right away, and you’re not limited to which games you play, but be mindful that certain games will in effect increase your rollover requirement. The Miami Club is a loyalty program that you’ll be automatically enrolled in when you deposit at least $25, which is the minimum deposit. 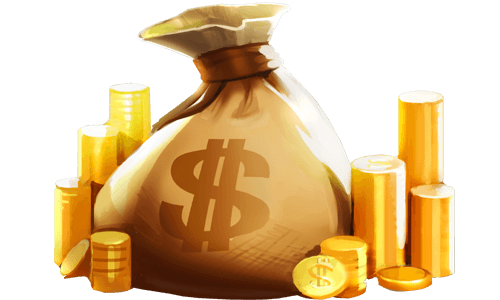 This is a robust VIP program as far as online casinos go and we won’t be able to cover all of it, but we did want to touch on the deposit bonuses it offers. The Miami Club offers a welcome package worth as much as $800. This is spread across eight deposits, so you get up to $100 each time, and each bonus is a 100-percent match. You can take advantage of the $200 welcome offer first and thus claim a possible $1,000 overall. A neat aspect of the Miami Club deposit bonuses is that the bonus money actually contributes toward earning reward points! The daily deposit bonus is also part of the Miami Club and ensures that you get a bonus each and every time you make a deposit. The bonus depends on your Miami Club level, so it starts at 20 percent and can increase to as high as 45 percent. This promotion only requires a $10 deposit as well, and despite the moniker “daily,” you can take advantage of it as often as you like, including multiple times a day. Sign Up to the Miami Club Casino Today!